Porters are paid a minimum of 20,000Tsh per day, the wage amount accepted by the porter unions in 2014. Please keep in mind that the lower the costs of a climb, the higher the probability that an operator may not be adhering to proper treatment standards. As a result, well-meaning individuals and organizations inadvertently become part of porter exploitation by climbing with a company that sacrifices the salaries and working conditions of their staff in order to offer low climb prices. Kindly note that there may be specialty porters on your climb with positions such as waiter, camp crew, toilet porter, summit porter, medical porter. It is ideal if these porters receive extra compensation for their additional responsibilities beyond a regular porter. While we realize that tipping may not be a common practice in all countries and cultures, it does play a part in the financial compensation for a Kilimanjaro climb. KPAP advocates that companies pay porters 20,000Tsh per day. This is a good basic wage but it does not equate to a living wage. KPAP advocates that fair compensation – from salary and tip – for a porter’s work done properly is 32,000Tsh per day (US $14.00). We encourage climbers to consider a tip amount that would supplement the salary payment to attain at least 32,000Tsh (US $14.00). Tipping is, of course, still based on the crew meeting your expectations. In order to determine the appropriate tip amount, it is necessary to know the wage amount per day paid by the climbing company as well as the number of porters assisting the climb. 6,000Tsh/day you would tip at least 26,000Tsh/day for every porter. 8,000Tsh/day you would tip at least 24,000Tsh/day for every porter. 15,000Tsh/day you would tip at least 17,000Tsh/day for every porter. 20,000Tsh/day you would tip at least 12,000Tsh/day for every porter. Following KPAP’s tipping recommendations will ensure your crew are paid an appropriate living wage for the labor intensive work that supports your climb. Companies that are a Partner with IMEC’s Partner for Responsible Travel Program are required to pay their porters a minimum wage amount of 20,000 Tsh/day to guarantee a basic standard and lessen the burden on the tipping. Climbing companies should share tipping guidelines and a transparent distribution procedure before you begin your climb. You should also be informed of the number of crew that will be assisting you during your climb at your Climber Briefing. If your company does not provide this information, please ask them. This information will help you know the amount of tip before the climb. We encourage you to meet your crew at your 1st campsite to ensure you have the number of crew promised by the company. You can write a list with each crew person’s name and refer to this list at the end of the climb when you distribute tips. It is ideal to have a tipping ceremony during the last meal on the mountain or at the descent gate. Tips can be placed in individual envelopes with the climbers giving them directly to each crew person. We highly recommend tipping each crew person directly to ensure that the full amount of tip is received by the crew member. If you choose to give the full tip to the guide, please announce the total amount in front of the entire crew and indicate the tip amount that each porter will receive. The guide should repeat this in English and Swahili so that all can understand. 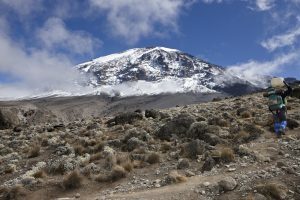 The practice of kirunje can exist on Kilimanjaro. This occurs when extra porters are present at the tipping ceremony who, in reality, did not work on your climb. The aim is to obtain extra tip money from the clients. We encourage you to know the exact number of guide/s, cook/s and porters supporting your climb. KPAP depends on donations and grants to help fund our free programs for porters. You can help support the work of the Kilimanjaro Porters Assistance Project.